ON THIS DATE (June 8, 1950) ... The Red Sox went on a record-shattering run-scoring and base-hit binge before 5,105 perspiring customers and four shell-shocked St. Louis Browns pitchers at Fenway Park this afternoon for a thunderous 29 to 4 triumph. 1. Runs scored in a game -- 29. The former record was 28 by the 1929 St. Louis Cardinals. 2. Runs batted in a game -- 29. The former record was 26 by the 1926 New York Giants. 3. Total bases in a game -- 60. The former record for 55 by the 1893 Cincinnati Reds. 4. Most runs scored in two consecutive games -- 49. The former record was 45 by the 1925 Pittsburgh Pirates. 5. Most hits in two consecutive games -- 51. The former record was 49 by the 1922 Pittsburgh Pirates. Al Zarilla equalled two marks, four doubles in a game and two in one inning. Chuck Stobbs drew four consecutive walks in three consecutive innings, which must be another record. 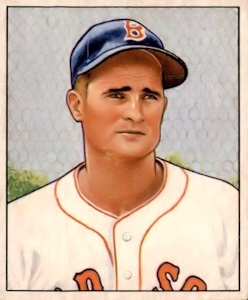 The chief power man of the Sox was Bobby Doerr, who for the first time in his illustrious 14-year career, hit three home runs in one game. He knocked in eight tallies. Walt Dropo batted in seven. All told the Red Sox hit seven homers, one shy of the major-league record. Ted Williams and Dropo hit two apiece. The Sox batted around in three successive innings -- second, third and fourth -- which is probably another of those off unlisted records. During those three rounds, the Red Sox scored 20 runs and sent 34 men to bat. This, too, is an unofficial record. All told the Sox made seven homers, nine doubles, 11 singles and one triple. They have hit 12 homers in their last two games, one shy of the 1938 Yankee mark of 13 in two consecutive games. Centerfielder Clyde Vollmer was the least potent Red Sox slugger. He went to bat eight times in eight innings for a new modern day record, made one hit and drew one walk. Zarilla and Johnny Pesky made five hits each. Curiously, Zeke didn’t drive in a run on his five swats but Pesky picked up two RBI’s. Clif Fannin and Cuddles Marshall were the victims of the 20-run assault during the second, third and fourth rounds. Sid Schacht was the victim of the record breaking barrage. His last serve to Doerr in the eighth, which Bobby slammed over the left field screen to break the run scoring record. In that frame, Six faced six men. Doerr, Dropo and Williams homers. Pesky doubled and Stephens singled. Zarilla was retired on a fly ball which centerfielder Roy Sievers bagged a foot from the bleacher wall. Chuck Stobbs pitched eight-hit ball to pick up his fourth win of the year. He has lost one. Charley walked seven and hit one batter. He was conked for three runs in the third on two walks and three hits.